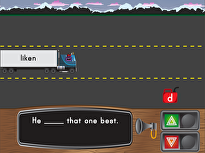 Students will be able to use periods, question marks, and exclamation points correctly. Prior to this lesson, cut out and hide the three large punctuation marks somewhere in the room. For example, stick one of the punctuation marks in a place where it doesn't belong, such as taped to a computer or stuck to the corner of a bulletin board. Tell your students that they have some sentence mysteries to solve. Introduce the task of searching for the hidden punctuation marks. Invite your students to play “I Spy” with three different punctuation marks: a period, a question mark, and an exclamation point. 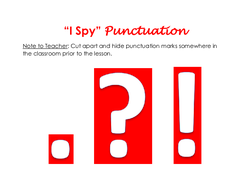 Ask your students to look around the room and signal when they locate a punctuation mark. Signals can include standing up or raising a hand. After all three punctuation marks have been located, tell your students that they're going to be learning more about how to use those three different punctuation marks. Explain to your class that sentences can be used to tell, ask, or exclaim. 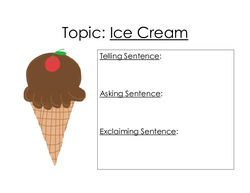 Using a single topic, such as ice cream, model the process of writing a different sentence for each of the three punctuation marks. For example: What's your favorite flavour? Ice cream has milk. I like ice cream! After writing each sentence, hold up the corresponding large cut-out. After holding up the Period, explain that a period is used at the end of a "telling" sentence. After holding up the Question mark, display the Question Words poster. Explain that a question mark is used at the end of an "asking" sentence. 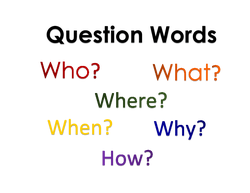 The words on the poster are often used in "asking" sentences. After holding up the Exclamation point, explain that an exclamation point is used at the end of an "exclaiming" sentence in order to show a strong feeling. 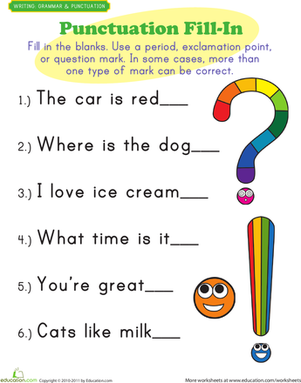 Ask your students to share some examples of times when they might use an exclamation point. Display the Teacher Modeling poster at the front of the classroom so that your students can reference the examples for the remainder of the lesson. Take out the three punctuation marks that were originally used for “I Spy” and initial modeling. Tell the students that they are now going to practise using punctuation marks with sentences from the lunchroom. Prior to beginning the next step, have your students to share different ideas about the lunchroom. 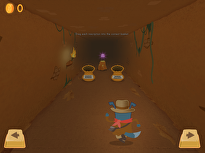 Guide the students in turning their ideas into telling, asking, and exclaiming sentences. For example: The lunchroom has twenty tables. Does the lunchroom have chairs? 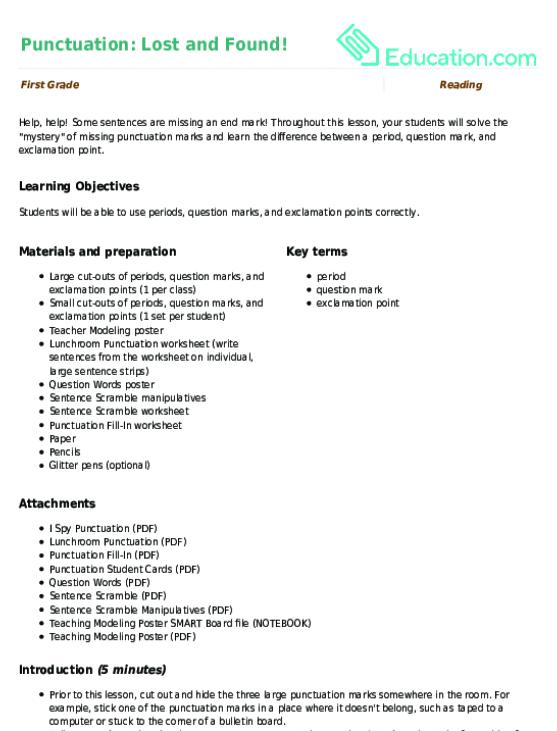 Invite your students to select the appropriate punctuation mark for each sentence. 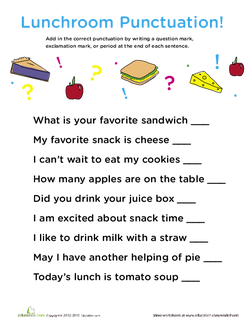 Next, utilizing the sentences from the Lunchroom Punctuation worksheet (written onto individual sentence strips), have your students practise putting the correct punctuation mark at the end of each sentence. 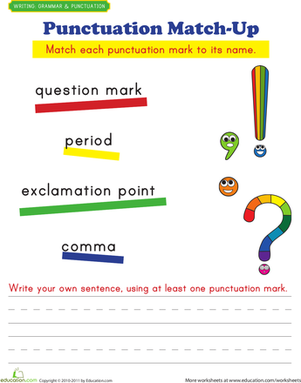 Invite your students to use the large punctuation marks from the beginning of the lesson to complete the ending of each sentence. 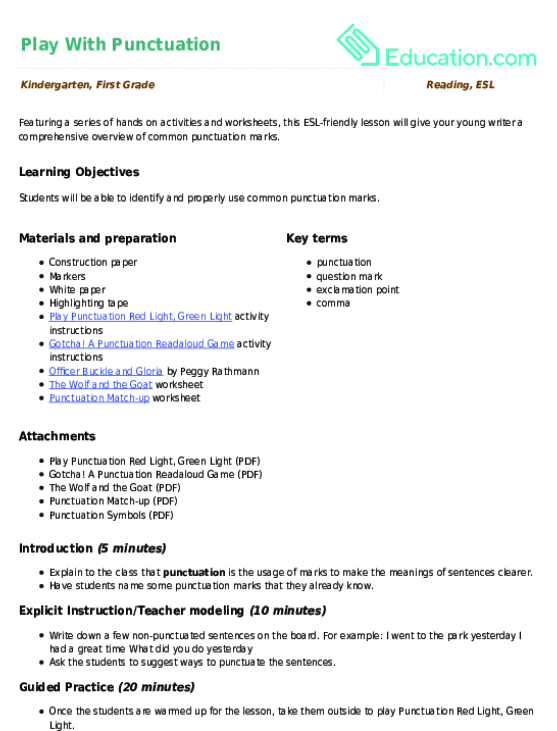 Tell your students that they will now practise using punctuation marks on their own. 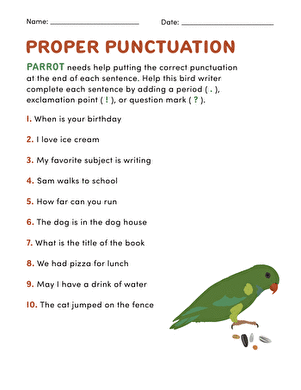 Distribute the Punctuation Fill-In worksheet. Circulate around the room to help individual students as needed. 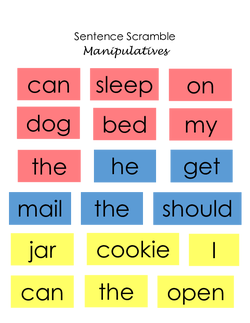 Enrichment:Give your students the Sentence Scramble worksheet and manipulatives. 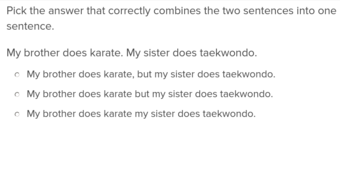 Have them use word manipulatives to create two types of sentences with the same words, and then direct them to write the sentences they made on the worksheet. Support:Guide your students through a shared writing exercise, creating three different sentences with the individual punctuation marks. 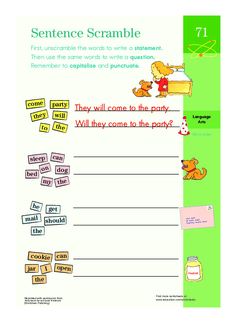 Have your students write the sentences on sentence strips. 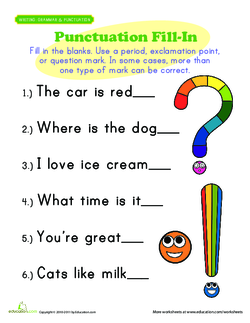 At the end of each sentence, have your students use a glitter pen to form the corresponding punctuation mark. Using Google Draw, have students create a drawing that could be used to formulate three different kinds of sentences with one topic. 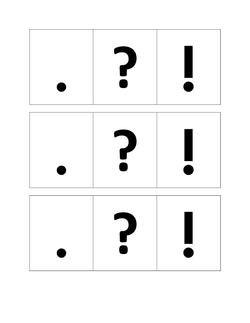 Distribute one set of individual punctuation marks per child. 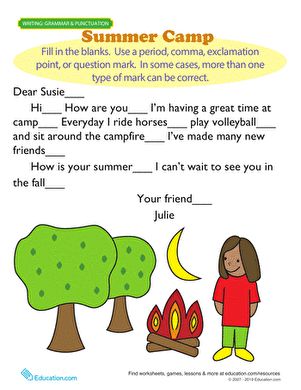 Using the first three sentences from the Punctuation Fill-In worksheet, display example sentences on the board. After reading each sentence, ask your students to hold up the punctuation mark that should be used at the end of the selected sentence. Play “Punctuation Charades” with your class. Instruct your students to use their bodies to represent the punctuation mark that matches the end of the sentence. Display or read the following three sentences, one at a time: Great job on your work! It is raining outside. Where is your pencil? After each sentence, invite your students to use a body motion to represent a punctuation mark. To represent a period, have your students curl up into balls on the floor. To represent an exclamation mark, have them jump in the air once and then curl up into balls. To represent a question mark, direct your students to move their arms in the shape of the question mark. The punctuation has gone missing, and we need your students' help editing these personal narratives!